What could possibly make my two year old so scared of an eyeglass commercial? Posted February 28, 2012 under Ask the Mediatrician. My 10-year-old son is miserable since I took away Call of Duty–what do I do? Posted February 24, 2012 under Ask the Mediatrician. Am I being paranoid if I don’t want to post pictures of my baby on Facebook? Posted February 21, 2012 under Ask the Mediatrician. 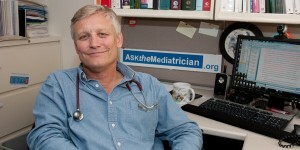 Posted February 17, 2012 under Ask the Mediatrician. My 5 year old is afraid of TV—what do I do? Posted February 15, 2012 under Ask the Mediatrician. When is it time for my daughter to get an email account? Posted February 2, 2012 under Ask the Mediatrician.